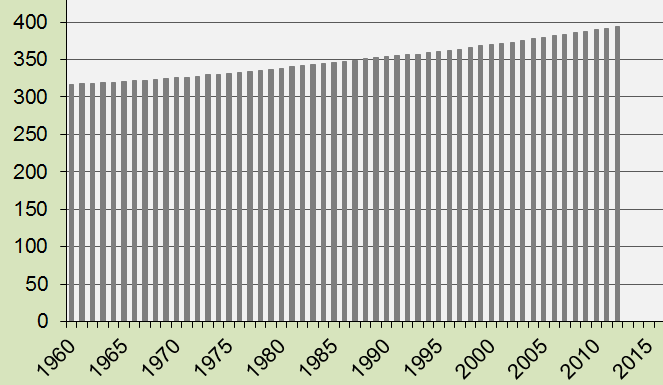 Global warming is caused mainly by human CO2 Emissions.The diagram above shows China’s annual CO2 Emissions (carbon dioxide) in tons per capita 2000-2011 (the black bars). 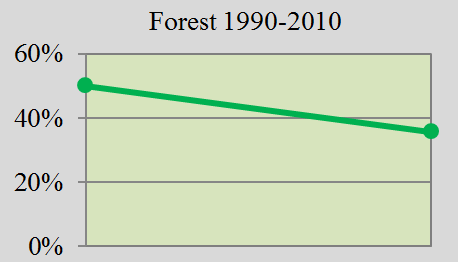 The green bars show the Contribution Free Levels in ClimatePositions. The free level of CO2 Emissions is dependent on various indicators (see the menu “Calculations/Indicators”). China was the 57th worst performing country out of 145, in terms of Contribution (climate debt) per capita. 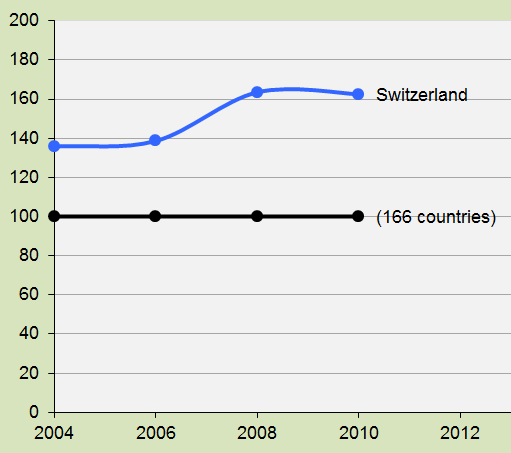 The total national Contribution increased from 26 billion US$ in 2005 to 185 billion in 2010. This explosive negative development is outstanding in the world and China is now by far the largest CO2 Emitter. The diagram shows the Global Population the last 52 years. In 1960 the Global Population was 3.02 billion and in 2012 it was 7.03 billion. The annually updated figure is included in the latest version of ClimatePositions with impact on the national Climate Contributions (climate debt). The 5 largest CO2 Emitters in 2006-2010 were 1. China (23,2%), 2. United States (19,7%), 3. Russia (5,3%), 4. India (5,1%) and 5. Japan (4,0%). These 5 countries accounted for 57,3% of the global CO2 Emissions (carbon dioxide). 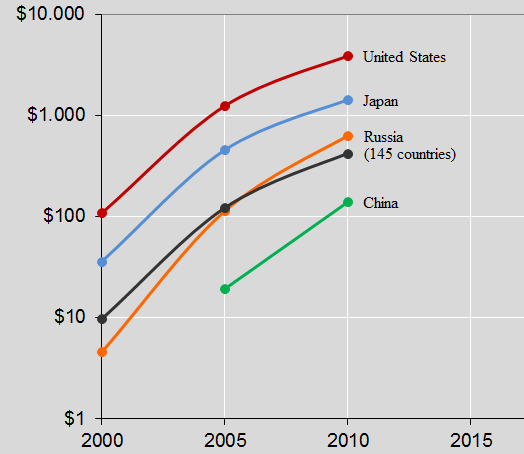 The diagram above shows the Contributions (climate debt) per capita in 2000, 2005 and 2010 (the black line is the global average). India was Contribution Free. Note the logarithmic scale. On the list of the worst performing countries (climate debt per capita) the ranking in 2010 was as follows: United States (no. 7), Japan (no. 18), Russia (no. 31), China (no. 57) and India (Contribution Free). See the full country list in the menu Contributions/Per Capita US$ Rank. 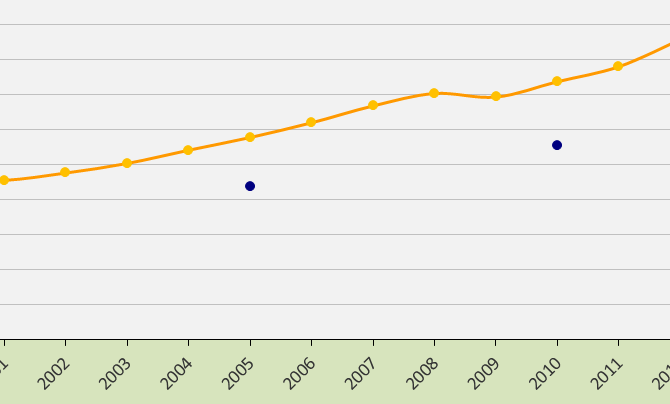 The GDP(ppp-$) growth rate in Malaysia is higher than the global average, as illustrated in the diagram 2000-2012. Subject to modifications in the data source. The blue dots shows the global GDP(ppp-$) in 2000, 2005 and 2010. The increase in Malaysia’s prosperity causes a corresponding, but delayed, increase in the Climate Contribution (climate debt) in ClimatePositions. In 2010 Malaysia was the 38th worst performing country. 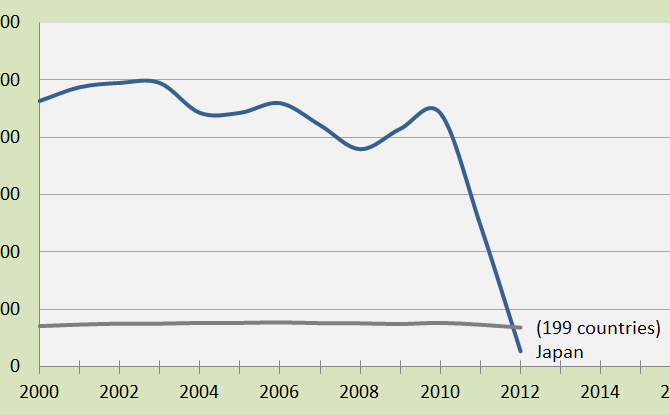 35 African countries are Contribution Free in ClimatePositions 2010 – 8 countries are not. See the global country list in the menu “Contributions”. The diagram shows Africa’s share of the global: 1) Population 13.52%, 2) GDP(ppp-$) 3.30%, 3) CO2 Emissions (2006-2010) 3.15%, and 4) Climate Contributions 0.95%. Africa is obviously not responsible for the climate change. In 2010 Japan was the 3rd largest Nuclear Power producer, but after the tragic Fukushima nuclear disaster in March 2011, the country dropped to no. 18 in 2012. 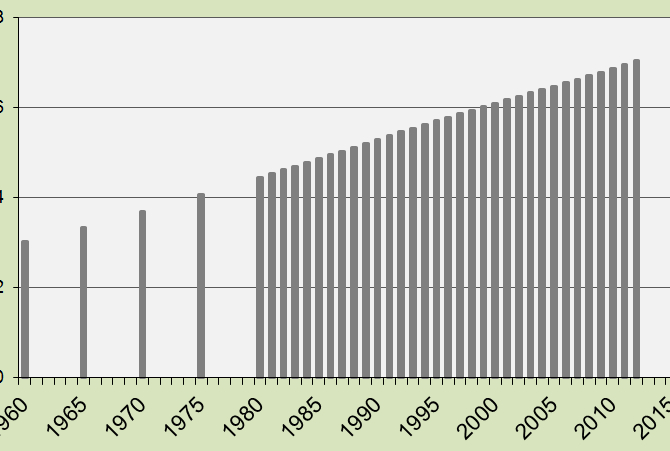 The diagram shows Japan’s Nuclear Power generation in kWh per capita 2000-2012. 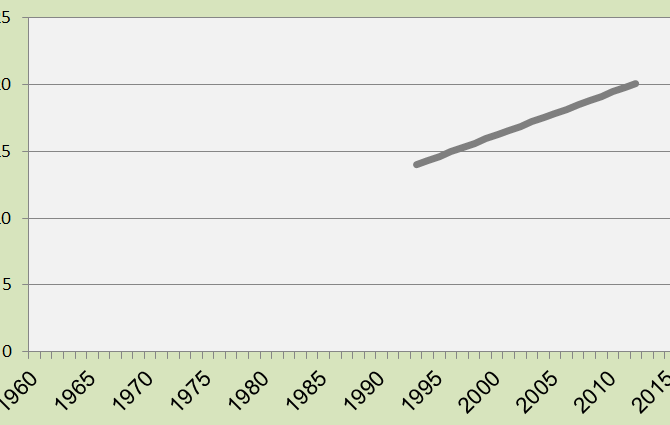 The grey line shows the global generation per capita.